I have a bit of an emotional narrative around water, both from my teen years and also as a parent. And these experiences have reinforced my belief that swimming is a life skill (not an optional extracurricular). Through an editorial partnership with the JCC’s Lenny Krayzelburg Swim Academy, I was intrigued to learn more about survival-based swim programs. Read on for my Q & A with director Korrinn Lubarsky (who can be seen in the photo below, teaching her 3-month-old daughter Harper to float on her back). 1. How do survival-based swim programs differ from regular swim classes? With traditional swim lessons, the approach is an introduction to water (e.g., singing songs, getting your child comfortable in a larger body of water than their infant tub at home). With survival-based swimming programs, the approach focuses on water safety and not only teaches children how to swim, but what to do if they fall into the water. 2. What do kids learn in survival-based swim classes? Survival tests are used where children are gently tossed into the water fully clothed. The theory behind keeping children’s clothing on is because statistics show that children who fall in the water are typically clothed. They are taught to respond appropriately based on their experience level to show they can save themselves. Swimmers are taught to roll over onto their back, called a survival float. This is essential because if you fall into the water, the first instinct of rolling onto your back and floating so you can breathe is critical to survival. Survival tests provide parents and children with the confidence of knowing their child knows how to save themselves in the water. 3. Does this approach scare kids? Children can be a bit nervous when they first start their lessons. This is a new environment for most kids and they are learning to be comfortable in the water and with their instructor. We build upon the survival float from the start of the first lesson. Some children are still frightened, yes. However, each week we build confidence and slowly reduce a child’s apprehension. Some children do not pass their survival tests when it comes time to take it, and that is OK! Whenever you start a new skill, it takes time, practice and consistency to excel at it. 4. How early can you start teaching survival-based swimming? Kids can start survival-based swimming programs as early as three months old. Some parents think they should hold off on swimming until their child is a little older because they don’t think they will learn much at that young age. They say, “How much can babies really learn when they are three months old?” You would be surprised! 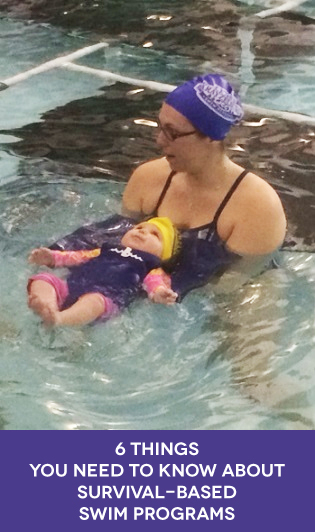 Little ones will start by getting used to being in the water and learning to float. 5. Why is it important to consider a survival-based swimming program? Being a certified instructor for over 15 years, I have been exposed to and taught many different approaches to swimming. I grew up learning the traditional method and there is nothing wrong with that! However, back then, drowning statistics were not as alarming as they are today. According to the Centers for Disease Control and Prevention, drowning is the leading cause of death for young children ages 1 to 4, and one of the leading causes of death for children under the age of 13. Since drowning statistics have been on the rise, it makes it more imperative for children to learn what to do in the water. 6. If my child already knows the basics of swimming (crawl, treading water), should they take a survival-based swimming program or focus on stroke improvement? Most survival-based swimming programs have stroke improvement and development wrapped into the curriculum. The curriculum is usually a structured and detailed sequence of building upon each skill. Even though you will be mastering all four swimming strokes, the water safety component is still evident with different drills and skills being tested. The goal is to create water-safe children and proficiently sound swimmers. For more information about survival swimming programs in your area, contact director Korrinn Lubarsky at the Lenny Krayzelburg Swim Academy at the Leventhal-Sidman Jewish Community Center in Newton at lksainfo@jccgb.org.